nrStar™ Human tRF & tiRNA PCR Array profiles 185 prevalent tRFs or tiRNAs compiled in the databases and newly reported in recent publications. nrStar™ Mouse tRF PCR Array profiles 88 prevalent tRFs selected from the tRFdb database. • Convenient–Easy-to-use, ready-to-run, standard qPCR plate format for direct sample application. No sample pre-amplification is needed. In order to distinguish tRF&tiRNA from its precursor and achieve high specificity, rtStar™ First-Strand cDNA Synthesis Kit (3’and 5’adaptor) (cat # AS-FS-003 ) is required to be used with nrStar™ tRF&tiRNA PCR Array for tRF&tiRNA detection. 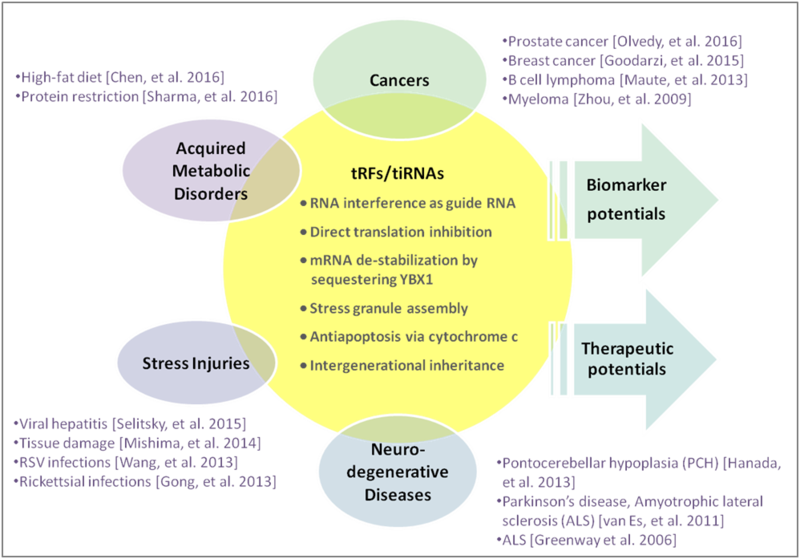 tRFs & tiRNAs perform many biological functions to act as microRNAs in RNA interference; regulate target mRNA stability; assemble stress granules in response to cellular stress; modulate apoptosis; and pass on as epigenetic factors in intergenerational inheritance  (Fig. 1). The composition and abundance of tRFs&tiRNAs are highly dependent on the cell types and are associated with many disease conditions. The highly enriched presence in biofluids, often much more so than microRNAs, makes them excellent biomolecules for biomarkers [2-5]. Figure 1. tRF & tiRNA functions and associated diseases. tRF&tiRNAs are generated from tRNA or pre-tRNA through precise biogenesis processes. It is difficult to distinguish tRF&tiRNA from its precursor (tRNA or pre-tRNA) by conventional qPCR for their sharing of the same sequence. Moreover, length of tRFs&tiRNAs are 16~50 nt, too short to perform qPCR process. Arraystar exploit a smart system by introducing two artificial sequence to the 3’and 5’end of tRF&tiRNA, a famous and validated technology used in small RNA library preparation for sequencing. Corresponding forward and reverse primers targeting 5’and 3’ junction effectively discriminate tRF&tiRNA from its precursors and other small RNA, thus getting a reliable and accurate detection of tRF&tiRNA expression (Figure 2). Figure 2. By introducing 5’and 3’adaptors, nrStar™ tRF&tiRNA PCR panel detects the specific tRF&tiRNAs with no amplification of tRNAs or pre-tRNAs. nrStar™ tRF&tiRNA PCR Array System is designed to conveniently and quickly profile the tRFs & tiRNAs with high specificity, composed of two products: rtStar™ First-Strand cDNA Synthesis Kit (3’and 5’adaptor) for adaptor ligation and cDNA synthesis, nrStar™ tRF&tiRNA PCR Array for tRF&tiRNA detection. Figure 1. tRF&tiRNA qPCR array workflow.